Spam spam spam egg spam spam sausage and spam? MySpace owners are striking back at a spam invasion which polluted the MySpace website with millions of unsolicited ad messages. 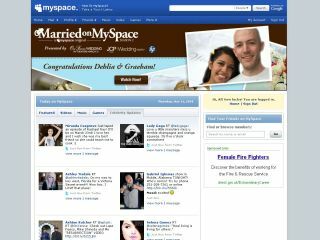 MySpace is suing Scott Richter , the so-called 'Spam King', claiming he is behind the scheme which sends advertising messages to MySpace users disguised as messages from their friends. Richter also stands accused of pioneering phishing scams to steal users' passwords. The scheme works by spoofing the MySpace site, getting 'MySpacers' to click on external links and asking unwary users to re-login. Their log-in details are then used for fraudulent means, while the users remain none the wiser. He has previously been very outspoken on the subject of spam, once claiming to have sent 100 million emails in just one day. And this is not the first time Richter has been in trouble with the law. He faced a $50m judgment in Washington state after Microsoft sued his company for sending millions of spam emails to its Hotmail users. He ended up paying less than 10 per cent of that after filing for bankruptcy.